Can dogs be depressed? It is a question that can come up a lot with us dog owners. We love our pets, and that closeness means that we often know when something is not quite right. If our dog seems to be slower, more listless than normal and there seems to be no apparent health issues, we may ask ourselves, is our dog depressed? Experts agree that dogs can get depression, with the causes and symptoms being much like depression in humans. If there has been a recent environment change to the dog, maybe you have moved house or a new born baby has entered the family equation – your pet may be adversely affected by these changes. Although Veterinary Behaviorists agree that dog’s can be depressed, they stress that long term depression is unlikely, it is more a case of a dog being temporarily ‘down’. Clearly a dog cannot experience psychological disturbance to the same degree as humans, meaning the search for any deep founded underlying mental issues is futile. Besides, dog’s cannot communicate their woes as humans can. However, as you will see from other articles on Can Dogs Eat This, these same symptoms exist for countless medical problems a dog maybe experiencing. Vets recommend that if you signs of depression in your dog, (lethargy, loss of appetite etc) your first move should be to take your dog in for an examination. If a medical health check comes up with no issues, dog depression may be present. As we have touched upon, major changes to a dog’s life could lead to depression. They are animals who are very sensitive to change, be it environmental or social. A new home, a new baby, a new partner a new cat or dog being brought into the household – these are all changes that could bring about negative feelings in your dog. Strangely however, and this goes a long way to show the affection that dogs have for those around them, a dog is more likely to become depressed after the loss of another animal in the household, (dog, cat, rabbit or otherwise) and the loss of their owner. These losses can have a dramatic affect on a dog, and can very often cause our poor emotional pets to show all the normal signs of depression. 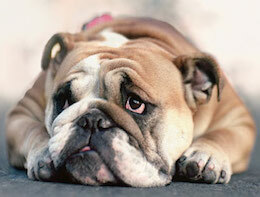 There are a wide range of treatments suggested to help alleviate dog depression. Everything from homeopathy, to playing soothing music, increased attention and massages and even drugs, (some behavioral scientists suggest the use of mild doses of Prozac like drugs designed for dogs). Time is always a great healer as they say, and any environmental change that may have impacted your dog will subside as your pet becomes used to the new circumstances. During this time, ensure to give your dog the affection he needs. You should also watch their diet and other health issues – make sure they are getting regular walks and play time. Even if the spring in their step seems to be gone. Overall though, if you do see signs of depression in your dog – take him to the vet for an experts view. As we say, mild symptoms may be signs of wider health issues. The faster you react to these, the sooner your dog can have the relevant treatment and will be back to their old selves.